Puntos Necesarios: 21150 Software is not compatible with mobile and tablet devices. Please add this title to your Wish List and sign on to your the first club account from a desktop computer to complete your redemption. ABOUT PRODUCT PowerProducer is all you need to turn your photos and videos into Hollywood Blu-ray and DVD discs. It comes with complete disc authoring tools, supports the latest media formats and renders videos fast like no others. It is the essential disc creation software for your Windows 8 PC. PowerProducer also comes with professionally designed HD menu templates and disc label and cover de… sign plus printing software. FEATURES All You Need to Create Movie Discs All NEW Hollywood-Style Menus – Create stunning movie discs with the built-in stylish menu templates & 3D-like opening animations. Customize your menus to your desired look and feel - User-imported video and built-in designs are blended together for a new disc navigation experience. NEW Import 3D side-by-side photos and videos – Transcode them to your favorite 3D DVD, Blu-ray and AVCHD movie discs. Free Unlimited Templates from DirectorZone – download free menu templates from other users around the world. Compliant with the following authoring formats for DVD: DVD-Video on DVD-R/RW and with the following recording formats: DVD-VR on DVD-R/RW and DVD-RAM, DVD+VR on DVD+R/RW UNIQUE Right-to-Disc™ feature – Record videos directly from camcorders or webcam and write directly onto BD-RE, DVD+VR, and DVD-VR discs. NEW Built-in LabelPrint Software provides an easy way to personalize your discs with design templates for creating customized disc labels. NEW RAW Photo Support - Import files from Canon, Nikon Sony, Fujitsu, Olympus and other leading camera brands. NEW Support for MKV and FLV videos - Burn your downloaded videos straight from the internet to DVD and Blu-ray discs so you can enjoy them again on your player. 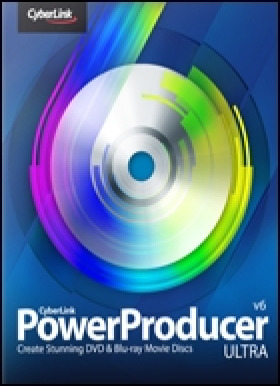 Essential Disc Authoring Tool for Windows® Windows® 8 Compatible - PowerProducer 6 is fully-compatible with the latest Windows® 8 Systems, works perfectly for your new PC with Windows® 8. Create Blu-ray & DVD on Windows® 8 PC - Create Blu-ray & DVD on your Windows 8 PC. With the newly designed 3D computer animation menus, you can turn your home videos into Hollywood-style movie discs in a snap. Edit Your Videos & Enhance Your Photos NEW Built-in PhotoNow! Software - Automatically fix lighting or color problems, remove red-eye, crop and resize or apply stylish photo effects to your photos. Fast Way to Cut, Split and Merge Videos – Enjoy multiple ways to create video narrative with quick and easy-to-use video editing tools. Simple Drag and Drop Motion – Easily arrange videos and slideshows on the timeline and add custom-made titles and transition effects!Produce Disc in Blazing Speed Ultra Fast video conversion - Optimized for the latest Intel® Core™ technology processors with Intel Quick Sync Video, AMD VISION APU Technology, Radeon graphics card and. NVIDIA® GeForce Technology. TECHNICAL DATA Operating System - Microsoft Windows 8, 7, Vista, or XP (Windows XP Service Pack 3 is required for HDV capture) Screen Resolution - 1024 x 768, 16-bit color or above CPU Processor - VCD / SVCD / DVD / -VR / +VR authoring: Pentium 4 3.0 Ghz or AMD Athlon 64 X2 or above (Required). AVCHD / AVCREC / Blu-ray Disc authoring: Pentium Core 2 Duo E6400, or AMD Phenom II X2 (Recommended) Graphics Card - 128 MB VGA VRAM or higher (1 GB or higher VRAM are recommended) DV/HDV - OHCI IEEE 1394 compliant device Capture - Analog video capture: USB or PCI capture devices compliant to WDM standards DV Camcorder video capture: IEEE 1394 I/O devices compliant with OHCI standardsDSC photo import: USB interface Memory - 512 MB required, 3 GB DDR2 or above recommended Hard Disk Space - Installation: 2 GB. Burning: 1 GB free for VCD production/ 10 GB (20 GB recommended) free for DVD production/ 60 GB (100 GB recommended) free for Blu-ray Disc/ AVCHD/AVCREC production Burning Drive - A CD or DVD burner (CD-R/RW, DVD+R/RW or DVD-R/RW) is required to burn VCD/SVCD/DVD/+VR/-VR/AVCHD/ AVCREC titles. A Blu-ray Disc recordable drive is required to burn Blu-ray Discs.